The East Coast chapter of Rebel Noise Group has booked a few Tri-State area gigs for November 2014. If you aren’t familiar with RNG, it is an All Star collective of professional Metal and Rock musicians lead by Doc Coyle whose current and former members include Tommy Vext (Divine Heresy, Snot), Kenneth Schalk (Candiria, Fuel), Kyle Konkiel, (Scar The Martyr, In This Moment), Ben Robbins (Gypsyhawk), Dave Mondragon (E-town Concrete, 40 Below Summer), Nick Serr (Lies Beneath, resoultion15), Moe Watson (Some Stranger, Deadwater Drowning), Mark Dollar (Lil Wayne), and Steve Perlmaster (Starkiller, Vext). 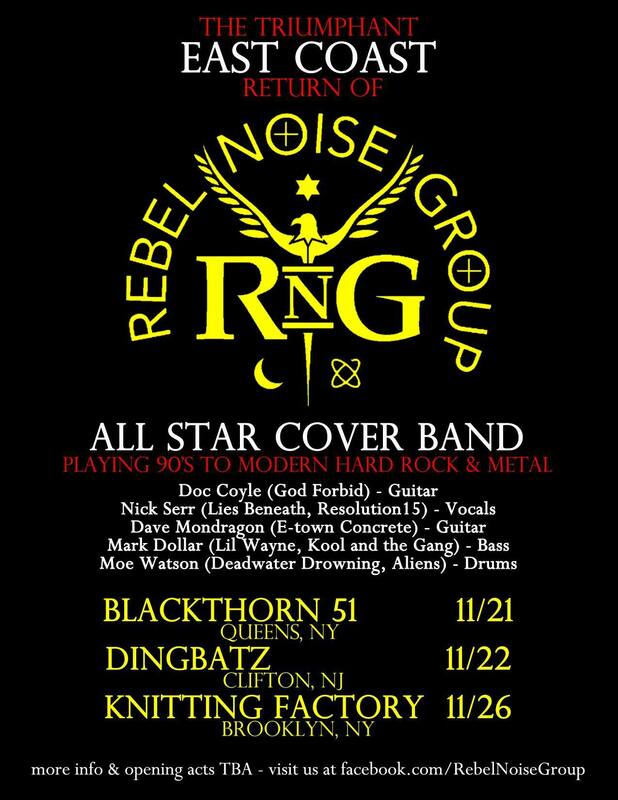 Rebel Noise Group plays 90’s to modern Hard Rock and Metal, but this is not your average bar band. The performances are passionate and powerful, unlike any cover show you’ve seen.